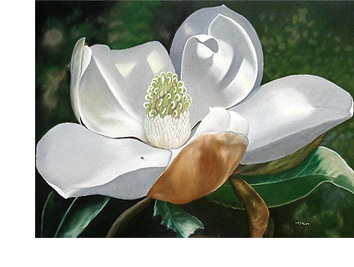 Learn how to paint flowers with an amazing classical realist artist, Delmus G. Phelps! 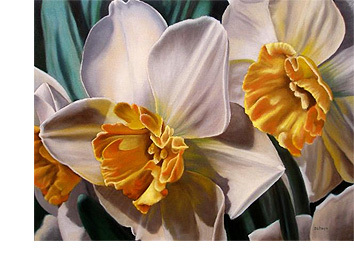 Delmus creates beautiful oil paintings of flowers that look so real, you just want to reach out and touch the delicate petals. With a careful eye and a masterful touch, his paintings glow with a breathtaking sense of realism. Delmus believes that anyone can learn to paint like he can, if they know the right steps! He was kind enough to grant Art is fun a wonderfully in-depth interview about his paintings and his techniques on how to paint flowers in oils. I was born in Germany as my Dad was stationed there while in the Air Force, and my mother is German. I was raised here in the U.S. I've been an artist since my earliest memories. My first commissioned work was in 1974 but I didn't begin to sell professionally until 1997. What is your favorite subject matter and why? I've enjoyed doing portraiture, landscape and the still life. I've migrated mostly to still life and floral in recent years. My big floras began after a special event in my life. While visiting my son Alex in Key West, (he is a US Coast Guard Diesel Mechanic) I came across a gallery featuring a Greek Artist named Vangelis Andriotakis. The piece in the gallery was at least 3 feet wide and 4 feet tall and I believe it was the original. 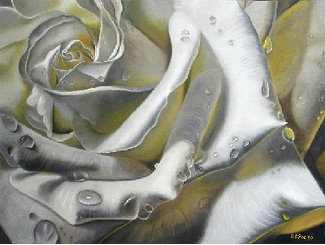 It was titled "Spanish Shawl" and was a depiction of what I think were three old fashioned rose blossoms very close up. I had never seen work like this before, and the piece made me just stand there like a kid that had seen his first Christmas tree with presents under it. My mouth was open and my son was chuckling at me. After a few moments I composed myself and I suppose that's when the seed was planted to begin work depicting flowers in a very close up view so the beauty of the flower is magnified one hundred times. Why do you enjoy working realistically? I do enjoy viewing impressionistic work and even some abstract pieces and am impressed with those that can create it. I've never been able to create something successful in that arena. The realistic side has appealed to me as I'm always asking myself, how did the artist create it. With close observation of the work, the brush strokes, colors, etc., I have been able to figure some of these things out. One of the first art shows I attended an artist had done some flower pictures in watercolor that from 3 feet away looked exactly like a photograph. The guy I'm sure was very tired by the end of the show as I peppered him with question after question on how he accomplished the work. (I was a curious teen back then). My present work is more to the romantic and classical side as opposed to photorealistic. If you could see some of my reference photos, you'd see quite a difference as I interpret the subject and produce what I believe is a work of beauty conforming to classical rules rather than a copy of the photo. How did you learn to paint in oils? My high school teachers introduced me to the multilayered technique of oil painting. An instructional book authored by Ken Davies further developed my technique. Another artist Alexia Antonov, helped me to understand the use of the mop blending brush and the importance of the Grisailles (gray layer) in this technique. I've tried other techniques including the wet-in-wet pioneered by William (Bill) Alexander and his protégé Bob Ross. Even now, I've enjoyed viewing a PBS series with Gary and Katherine Jenkins on this technique. I employ much of their suggestions within my color layers! What do you like best about working in oils? You can make an oil painting appear to be a watercolor, a pastel, and of course, an oil painting. It can be used to produce any form or genre of 2D art. But I feel it's most important attribute is it's proven longevity. Just look within your local museum. You'll find 400 year old pieces that look as fresh as they did the day they were created. Very few works created using other mediums can boast of this. What are the difficulties or pitfalls (if any) of working with oils? I've not found any! If you have solvent issues, then the water based oil painting products now available can make the medium usable for you. There is a single pitfall to the technique however. In our world of instant gratification, the multilayered technique requires patience, which is a hard virtue to come by within our modern culture. You can complete a painting using this technique in as little a 5 days, (I have an article showing you how coming soon!) But mostly it takes longer. Granted, you are only doing a few minutes to a few hours per session, but then the painting must be allowed to dry. I still can put out several pieces fairly quickly, but only because I'm working on several at the same time. What is your favorite brand of oil paints? I stick to the name brands but don't have a particular preference and today's standards require the manufacturers to adhere to certain criterion. There are sometimes differences in the texture for the same color from one brand to another, and you begin to purchase the colors you feel comfortable with. I purchase large tubes of my earth tones and white. My colors are purchased in smaller tubes because this technique lends itself to using very little color. What basic colors should a beginning oil painter buy? I use a very limited palette, yet when you see my paintings, you'd think I bought them all! Do you have any tips for people who are learning how to paint in oils? Most people wonder how I produce certain items within my paintings. They are usually near the center of focus, thus keeping the viewer pulled into the area of interest and are what I call “bling” within the painting. Similar to chrome accents on a Harley or even a Fancy Sports car to set it apart from the others. Or even the appropriately placed necklace or earrings on a lady to accentuate her beauty. These items are simply called water drops, or dew drops. And they are actually very easy to produce. Using 2 small brushes, 2 colors, and 6 brush strokes, you can create one! See my examples of this great little oil painting lesson and learn for yourself how to bump your paintings up to the next level! Many, many thanks to Delmus for such an in-depth and candid interview! If you'd like to learn how to paint flowers in oil paints, hop on over to his website where he provides detailed instruction about how to paint flowers in oils. He also offers downloadable oil painting art lessons so that you can learn how to paint in oils at your own pace. Click here to read my in-depth review of his oil painting e-book, A Real Art Lesson! You can also purchase archival prints of his lovely paintings or view his older artworks.